Karl Marx is perhaps one of the most influential philosophers of the last two centuries. His writings inspired revolutions in several countries and are still used today in support of worker’s rights and other socialist principles. His ideas are often associated with the timeframe of the Industrial Revolution since he witnessed and expressed concern for the horrible working conditions of the period. 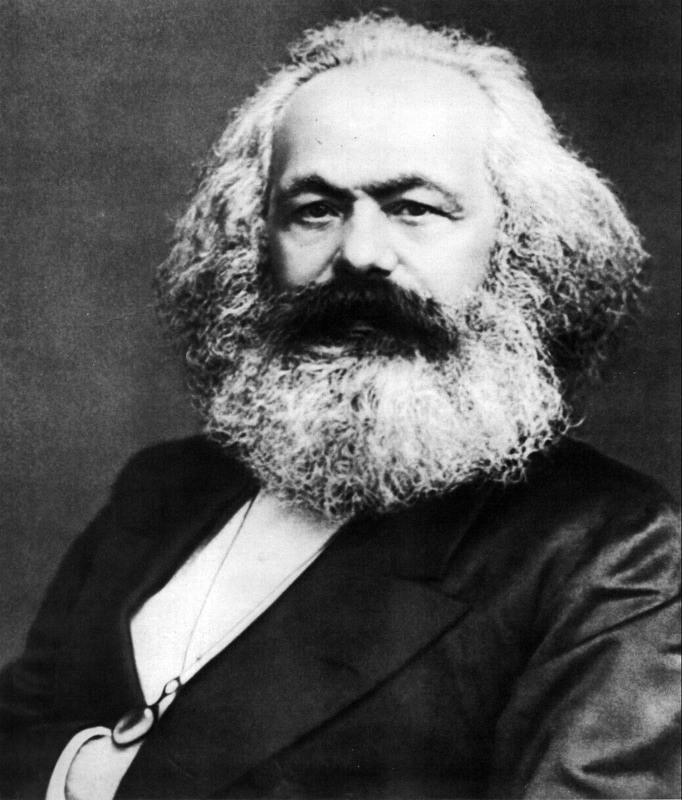 Karl Marx was born on May 5th, 1818 in Trier, Prussia which is modern-day Germany. His father, Heinrich Marx, worked as a lawyer and was interested in classical liberal ideals of the Enlightenment. His wife and Karl Marx’s mother, Henriette Pressburg, came from a successful business family before marrying Heinrich. As such, Karl was raised in a middle-class lifestyle. He was privately educated by his father until 1830 when he began to attend the Trier High School. In 1835, he attended the University of Bonn, studying law at the direction of his father. Due to declining grades, his father forced him to leave the University of Bonn and instead study law at the University of Berlin. Karl Marx became engaged to Jenny von Westphalen in 1836 as he was preparing for his studies at the University of Berlin. They didn’t marry until 1843. He excelled at the University of Berlin, and joined several groups that helped foster his leftist ideas. It was also around this time, in the late 1830s, that he began to write. While most of his early writings were fiction, including short stories and poetry, he soon began writing for academic works based on his political and economic ideals. For example, in 1842, he left Berlin for the city of Colonge, where he began writing for the Rheinische Zeitung or ‘Rhineland News’. It was here that he began to express his socialist ideas. Marx moved to Paris, France in October of 1843, where he continued writing for several different papers that were radical in nature. 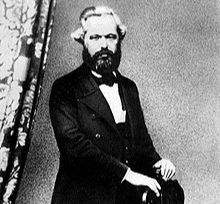 However, one of the most important events of his professional life occurred on August 28th, 1844 when he met Friedrich Engels, a German socialist, at a café in Paris. The two would collaborate on their writings that focussed on the conditions of the working class, and the growing income gap of classical liberal societies. Marx referred to his study of these conditions as the “political economy” whereas it has come today to be known as Marxism. After one of his newspapers was shut down in France, he and Engels, along with other socialist thinkers moved to Brussels in Belgium. While in Brussels, he and Engels began collaborating on several different works. The most important and influential of these is known commonly as The Communist Manifesto. 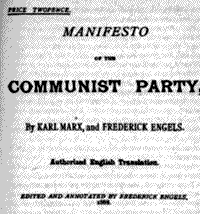 Written at the end of 1847 by both Marx and Engels, The Communist Manifesto was a political pamphlet first published in 1848 under the title ‘Manifesto of the Communist Party’. It was commissioned by the Communist League, an international communist organization that operated in Europe. Marx and Engels were associated with the Communist League and wrote The Communist Manifesto in order to clarify and articulate the ideas of the organization. In the pamphlet, Marx and Engels set forth the basic principles of Marxism that have gone on to influence many different thinkers and ideologies around the world. 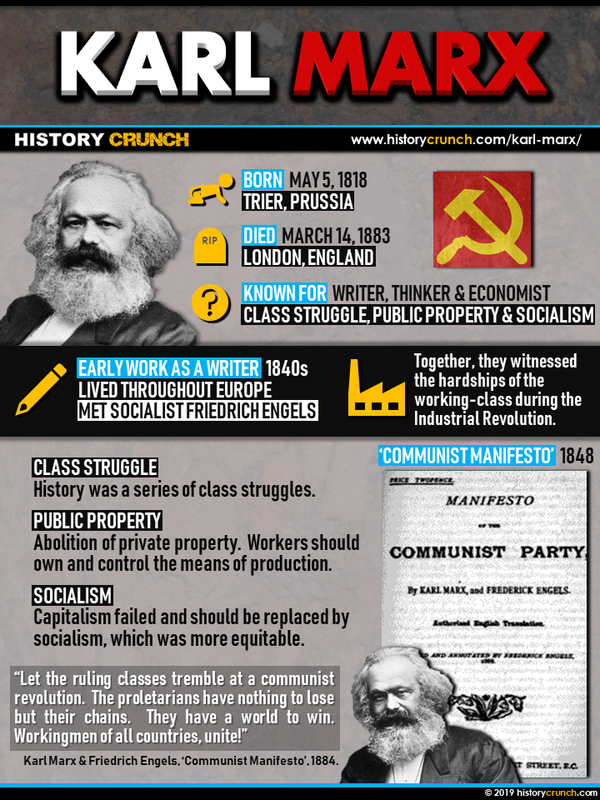 The basic ideas of The Communist Manifesto were centered on the nature of society and the struggles between different classes. According to Marx and Engels, the only way to overthrow capitalism was by means of a class struggle between the proletariat (industrial workers) and the bourgeoisie (wealthy owners). They argued that this workers revolution was necessary before any significant changed could be made in society. In general, they discussed the failings of capitalism and sought to bring about a final revolution that would end the struggle between classes. For example, in The Communist Manifesto, Marx and Engels argued that a socialist society formed by workers should involve a move towards the following: a shift from private property to public property, factories controlled and owned by the proletariat, free public education for all children. Following the publication of The Communist Manifesto, Marx moved between Paris and Cologne. He was the editor of a newspaper that helped spread several of the main ideas of the Communist Manifesto. In Prussia, he actively sought to bring about a revolution against the monarchy in hopes that it would lead to a revolution against the bourgeoisie. Forced out of Prussia by government forces, and unable to return to Paris or Belgium, Marx moved his family to London, England instead. He arrived in London in 1849 and remained in the city for the rest of his life. During his time in London, Marx worked as a correspondent for the New York Daily Tribune. The newspaper was popular with working-class people in America and allowed Marx an avenue to express his socialist views. As well, he continued to write his own essays and pamphlets. The most famous of these was Das Kapital or Capital: Critique of Political Economy which was first published in 1867. In the work, Marx discussed the underlying foundation of capitalist economies and how capitalism would ultimately lead to socialism. He argued against earlier liberal principles that were argued by others including Adam Smith. Das Kapital was ultimately a three-volume work that did not fully get published until after Marx’s death. Marx died on March 14th, 1883 in London, England. He suffered from poor health in the last months of his life which serious breathing problems. Although Marx failed to achieve many of the reforms he sought to during his life, his ideas spread across much of the political landscape at the time and influenced many other movements and political parties. His writings ultimately led to the spread of communism around the work and influenced worker rights movements in many democratic countries across Europe and North America.